There was a time before Burgman's, Majesty's and Silverwing's were born, when the biggest Asian market scooter was a 250 cc Honda Helix. With a top speed of only 65 mph it was the largest maxi scoot on the market, but could not cut it where road speeds were 65 mph and higher. No way to pass, no gumption and suspension that was nothing to write home about. All that changed when Honda launched the Silverwing, and Suzuki and Yamaha later launched their maxi mounts with the Burgman and Majesty models. Despite that, I've longed for a gutsy small scoot that is lighter in weight and more agile in the corners. Leave it to Kymco to come up with just such a ride. The Taiwanese company has been busy over the years expanding their scooter offerings from low cc rides all the way up to the Xciting 500 maxi. With all the latest technology, Kymco takes it down a step in motor size to bring the best of all worlds to the forefront with the introduction of the Downtown 300i, a fuel injected maxi scoot that makes corners more fun than ever before. My test ride went on for 200 miles and lasted all day. A trip around Oregon's majestic Mt. Hood using mostly secondary and tertiary roads showed me everything the Downtown was capable of and more. I started with a 10 mile stretch of interstate which revealed a top speed of 85 mph. Plenty of passing power for any of America's highest mph rated roads. 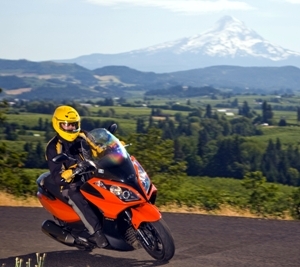 I then exited onto old US 30 and rode the Historic Columbia River Highway from Multnomah Falls to the robust Vista House, passing more than a dozen sport bikes in the process. At 300 cc's the scooter has no advantage over a sportbike on the straights, but the low center of gravity allows it to corner superbly and thus I was never re-passed by any rider I went around. During the ascent I was able to manage complete control of the scoot with simple throttle techniques and virtually no braking. My next jaunt was along the Barlow wagon trail, a sweet, now paved section of roadway that took me closer to Mt. Hood. Elevation changes are all over the place and the need to use braking for downhill sections was obvious. With the CVT providing a nominal compression ratio, it's not possible to put the scoot through it's paces downhill without some help from the front and rear disc brakes, which performed very well. After a brief lunch stop I headed up to Timberline Lodge on the south side of Mt. Hood. Again I was passing slower riders on larger bikes, never to be seen again until I reached the parking area at the top. The final corners of the day came as I climbed into the city of Hood River along a series of roads including the dubious Cooper Spur Road. While the Cooper Spur Road can often be fun, this day it had recently been oiled as part of a not yet complete chip seal process. The tires maintained good traction and the road eventually dried up on the final fun leg to Hood River. The Downtown is a great scoot for two types of riders. For newbies it's a fine choice. There isn't too much in the throttle to get a new rider into trouble and there's plenty of braking power. Maneuverability, both while traveling as well as from a standstill, is a cinch. For the experienced rider looking to shed a few scooter pounds, the 367 pound Downtown does just that, providing greater agility and handling abilities than a larger size scoot. And with a top speed in the 80's the scoot gets the job done in the passing lane. Experienced riders may often find the throttle is usually in one of two positions � closed or fully open. Acceleration can seem to take a while, which gives you more time to view what sport riders are wearing as you pass them by. Comfort-wise, the ergonomics are more suited for riding in the city, with not much room to stretch your legs out in a conventional fashion otherwise. You can lift each leg onto the top angle of the floor boards but it seems a little unnatural. Nonetheless, it does provide a needed change in body position from time to time. The stock seat fit my 160 pound body with a 30 inch inseam just fine and was comfortable throughout the day. The 40+ liter storage area under the seat provided the room I needed to store the gear I carry on a day ride (and I carry a lot). I'd add a top box for overnight trips. With a 3.3 gallon fuel tank and a 69 mpg rating the range is 200+ miles - plenty of range to get you between gas stops. 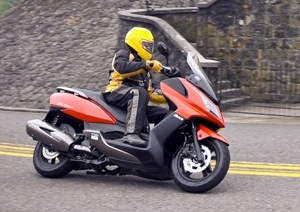 The Downtown 300i is Kymco's most innovative scooter yet, combining small scoot agility with big scoot ability. If this is a peek at things to come, we're looking forward to what's next. But for now this is a well done scooter everyone should take out on a test ride. Kymco scooters are available at Seattle Scooter Center and other fine dealers. For a complete list of dealers visit the KymcoUSA.com website.